A lot of self published authors shy away from the hard work of book marketing. It’s as if they fear the dirty work of selling will ruin the creative vision they’ve worked so hard to bring to fruition. The cold hard truth is this. You have to market your book, and as a self published author you generally have to do it yourself. Self publishing is a creative business. You don’t get to leave out the business part. Fortunately, we’ve talked to one of the book marketing gurus to make it clearer for you. We publish a monthly podcast called the eBook Revolution and we had a chat to book marketing guru Rachel Thompson from BadRedhead Media. In what turned into a masterclass of Book Marketing, Rachel walked us the essentials. Here’s our top 5 take aways, but go and listen to the entire podcast. A mistake many new writers make is they purchase a domain name for the title of their book (which in itself isn’t a bad idea). They’ll then go out and create Facebook and Twitter accounts for the book. This is great until a year or so later you come to writing your second book. 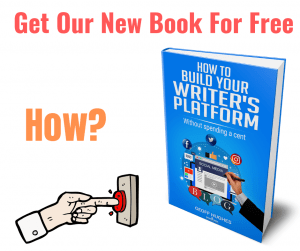 All of that work setting up a micro platform to promote your book will be forgotten – and largely useless. You want people to identify your name, because you will write another book, and another and another. So, when you start out platform building keep your brand in mind. Your brand is you. It can be tempting when setting up your platform, to go out and buy Twitter and Facebook followers. It’s not that hard to do but you really shouldn’t. It may give you short term boasting rights about your mythical thousands of followers, but the entire point of building a platform is to find and engage with your audience. When the time comes, if you’ve built that trust and are launching a book – you’ll have a tribe you can sell your books to. If your tribe is all fake, you’ve shot yourself in the foot right at the start. Don’t do it! Fake people will not buy your books. This gets back to basic research when you’re setting up your platform. Where are your readers? You can waste time and effort building your platform around the wrong social media. If your audience skews to an older demographic, Facebook might be an easier place to connect with them than Instagram. Do your research. Don’t make assumptions. We’ve touched on this before in this blog. It’s really tempting to do the cover yourself – especially if you’ve got a creative streak. The trouble is, you don’t know about colour design and font selection and the genre conventions that make a great book cover. Hire a pro that does and be careful you hire someone who is a book cover designer. You may hire a great graphic designer but if they’re not familiar with book cover design you’ll get a sub-prime result. Book cover design is a real art in itself and you will get a great return on hiring someone who knows what they are doing. Let’s just cut to the chase. Don’t start following writers and wonder why you keep getting sent promotional book links. It’s fine to follow some writers, but you want to be connecting with readers. Do your research, find out where your readers are and create great content. Don’t use social media to continually scream from the rooftops ‘buy my book!’. Twitter especially is a great listening platform. You’re not going to sell a book to other authors on Twitter but you can carefully cultivate and build an audience. You can listen to the entire interview over at the eBook Revolution Podcast. It really is a masterclass in book marketing. Even better, grab your self a copy of Rachels 30 day Marketing Challenge.